People of the internet. Let it be known that if someone sews you a tie, they must be in love with you. 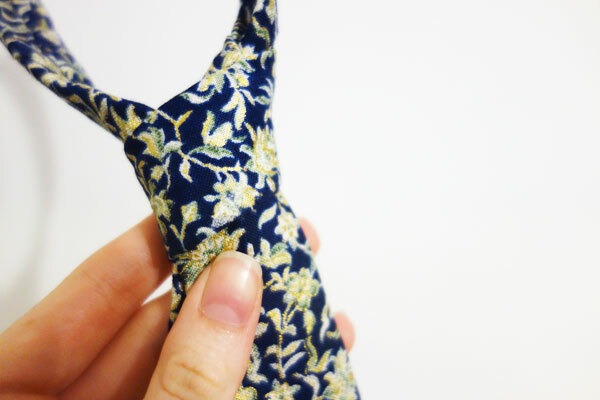 With many bow ties under my belt (so to speak), I recently quite blithely agreed to sew someone a tie. You know, the usual one; corporate staple, school boy stranglehold, wedding prerequisite. A tie. Just a tie. Well as it turns out, there’s more than meets the eye. A tie’s not just a tie. I followed along with a tutorial on Purl Bee that is super comprehensive and features a really great free downloadable pattern. As she mentions on the post, just make sure that you add in any extra length if you want it – this pattern is not as long as the standard 57” tie! As I was going to sew a skinny tie, I cut the pattern without seam allowances. This worked really well, as it retains the beautiful classic shape of the tie by just creating a slightly slimmer silhouette. To get a beautiful end result, you need to be a pedantic tie-maker. Herewith, some of my hindrances. The fabric that I used is a very beautiful, but I believe slightly too heavyweight, quilter’s cotton. A more lightweight fabric would make for a much better finished tie. It’s all in the feel and the fall of the fabric. Of course, silk – although notoriously difficult to work with – would make a great tie. Keep that in mind, pedantic tie-makers. Due to the fact that there is no hemming required in the making of a tie, the weight of the fabric also came into play when I needed to fold and press the edges in towards each other. Choosing the right fabric is essential to avoiding a bulky end result. For the pedantic tie-maker, a good iron is essential. For everyone else, may I remind you that more pressure does not make the iron hotter or the fabric more receptive to ironing. Also, be aware of your fingers at all times. Your fingers, when distracted by finicky work, are not as quick to withdraw from the heat of the iron. I did not find the sew-in interfacing to be a necessary addition. As I’ve mentioned though, if you’ve chosen the right fabric for the job, you may want to add this in. All this considered, I came out with quite a handsome-looking tie in the end. Thank you, Purl Bee!